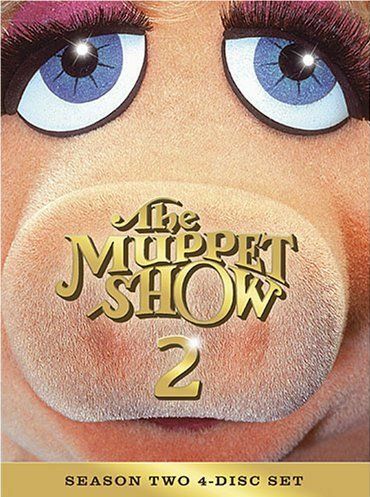 All you hard-core Muppet fanatics can rejoice, as The Muppet Show - The Complete Second Season is finally here! I know I saw the show when I was a kid, as I remember watching it with my parents, but I was young enough that I really didn't retain anything about the show. Stupid forgetful brain! At least it meant that watching this 4-disc DVD box set of the entire second season was like watching a brand new show for the first time... well, brand new except that it felt like it was produced over 20 years ago and I had no idea who many of the guest starts are. I recognized Don Knotts, Steve Martin, George Burns, and John Cleese, but out of 24 episodes, that was about it. Now, regardless of whether you've seen the show or not, I'm sure you know who and what the muppets are. If you don't, then you must be a sad, sad human being. The Muppets are a collection of puppets created by Jim Hension. Unlike most puppets that are just animated in the head, Muppets are have full body action... ohhhh yeaaaah! This helps to make them feel much more like real characters, and some Muppets even consist of a full body suit worn by a person. Though mostly, it's the smaller hand-controlled ones that take center stage. The stars of The Muppet Show are Kermit the Frog, Miss Piggy, Fozzie Bear, Gonzo, and Rowlf the Dog, but they have a whole bunch of other Muppets backing them up, such as Animal, Beaker, and those two old guy who sit in the balcony and make fun of how bad the show is. The show itself takes the form of a variety show, with musical numbers, comedy sketches, and backstage antics which usually involve Kermit trying not to loose his mind as everything goes awry. Each episode also features a real live human guest star of someone who was popular during the time. Some of them are comics, others are singers or dancers or musicians. You don't really have to know who the guest star is to enjoy them or the show, but it probably would help. And it would also help if you enjoyed musicals, because it seems like there are a lot more musical numbers in the season than there are comedians, and every episode has at least one musical number. Unfortunately, I'm not big on musicals. I enjoyed the comedy routines, and I loved those two old farts who sit in the balcony. I think they were probably the funniest part of every episode. Skits involving the guest stars sometimes work really well, but sometimes fall completely flat. Or maybe they did work and I just didn't get it because I didn't know who the guest star was or what their "thing" was. Of note in this season is that this is where Kermit sings his famous "It's Not Easy Being Green" song. I had always thought this came from one of the Muppet movies. Out of the guest stars, I think Steve Martin was probably my favorite. The first DVD box set was released on August 9, 2005, and the second box set will be available on August 7, 2007. Both sets include the full season of 24 episodes, making for a total of 48 episodes, which I think is the way television series should be released. No missing episodes and no splitting up a season. Plus, there are bonus features, such as 1974 Valentine's Day, an interview thing called "The Muppets On The Muppets" Special, and a Muppets music video titled "Weezer & The Muppets Keep Fishin'". I would definitely recommend this series to anyone who is a fan of the Muppets, and I think kids would probably enjoy it too even if they don't know who the guest stars are. It works well for both kids and adults, though adults who like musicals will probably enjoy it a lot more than adults who don't. Unfortunately, I'm one who doesn't, otherwise I would have scored this set higher, because it is a pretty good set. Oh, and I forgot to mention the DVD case. As with a lot of box sets, this one comes with an outer slip cover to hold the fold out case, but this one is unique as it features a zoomed-in picture of Miss Piggy's face... and it's textured! They made it feel soft and fuzzy, as you would expect her face to feel. I just wanted to mention it because it's a really nice touch. Check out the official Muppets website for more information. They didn't have any clips last time I checked, but they have an area for them so they should be coming soon. Kermit and Piggy Debate the Question "Are You Dating"
The Muppets Tackle the Question, "How Does it Feel to be a Role Model?" Interview with Animal: "What Makes You Truly Happy?"